I’m running out of “teens in mental hospitals” books! If any of you have suggestions I’d love to hear them. Please leave me a comment with any recommendations you have. 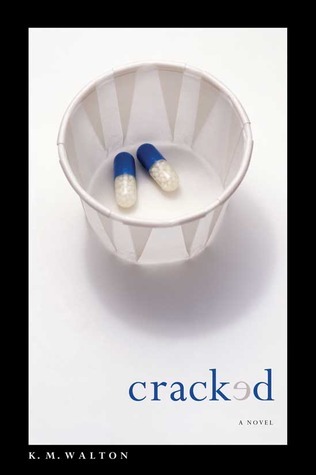 Cracked is an interesting take on this genre. Victor and Bull are the alternating narrators in this classic tale of bully vs. bullied, but the twist is that one of them actually shouldn’t be in the ward. Synopsis: After taking 25 of his mother’s sleeping pills, Victor is horrified to wake up in the hospital sharing a room with Bull, the person who has been bullying him for years. Waking up next to Victor isn’t what Bull was expecting either when he pointed a gun at his drunken and abusive grandfather. Stuck together in a tiny psych ward, things can’t get any worse… or can they? Wow… these kids both have it really really bad. I mean, it’s normal to see one set of parents in a YA book who are awful, but usually the rest of the adults in the book are fairly normal. Victor’s parents might seem like good people on the outside, but the way they treat their son is just insane. I’m actually surprised they didn’t just give him up for adoption the moment he was born. And the same can be said for Bull’s family. The constant blame he gets for even being born is just insane. The similarity of their family lives was obviously deliberate, but made for an interesting story when you consider how each boy handled the situation. I was impressed by how Victor’s story progressed, because so often in these books the main character meets a love interest in the hospital and somehow they manage to stay together afterwards against all odds. When the girl Victor likes leaves after a few days it hits him hard, but his realization that it was just a momentary crush is so refreshing. I feel like this is a way more healthy representation of life than all those insta-love stories that we see on a regular basis.